پرتاب چکش یکی از ۴ مادهٔ پرتابی در دو و میدانی است. ۳ مادهٔ دیگر پرتاب وزنه، نیزه و دیسک هستند. ↑ "International Competitions in Memory of Belarusian Athletes 2012 Results". EAA. 18 July 2012. Retrieved 18 July 2012. ↑ "Hammer Throw Results" (PDF). www.zlatatretra.cz. 24 May 2012. Retrieved 25 May 2012. 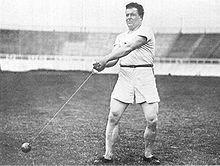 "Hammer Throw - Introduction". IAAF. Retrieved 12 December 2011. "International Competitions in Memory of Belarusian Athletes 2012 Results". EAA. 18 July 2012. Retrieved 18 July 2012. Nickolai Dolgopolov، Rostislav Orlov (6 July 2012). "Four world season leads and one national record at Russian championships - day ۳". IAAF. Retrieved 8 July 2012. "Hammer Throw Results". www.zlatatretra.cz. 24 May 2012. Retrieved 25 May 2012. این صفحه آخرین‌بار در ‏۸ آوریل ۲۰۱۹ ساعت ‏۱۸:۵۱ ویرایش شده‌است.